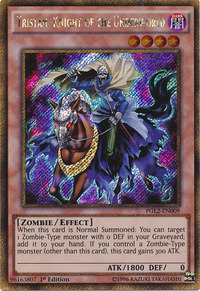 When this card is Normal Summoned: You can target 1 Zombie-Type monster with 0 DEF in your Graveyard; add it to your hand. If you control a Zombie-Type monster (other than this card), this card gains 300 ATK. This monster is based on the character Tristan of the Celtic legend of Tristan and Iseult, which is cited as an influence on the romance between Lancelot and Guinevere. This is further supported by this card and Isolde, Belle of the Underworld being ideal Xyz Material for Number 23: Lancelot, Dark Knight of the Underworld.